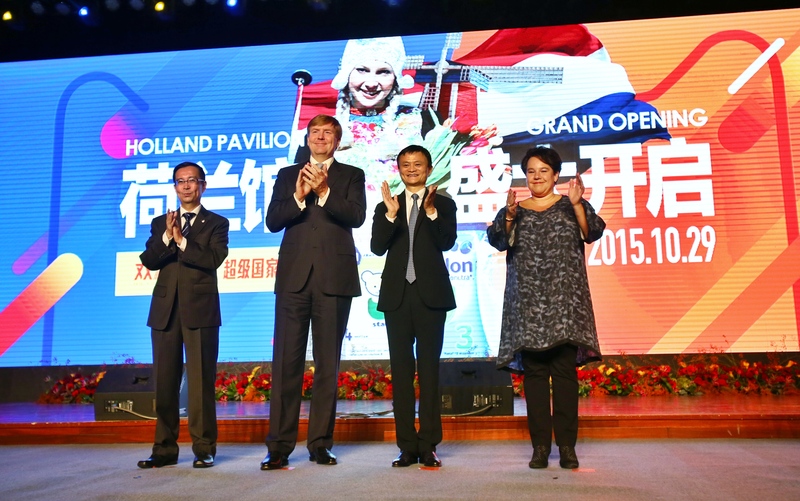 Hangzhou, China, October 29, 2015 – As another step in its globalization strategy, Alibaba Group (NYSE: BABA) today announced several major agreements on partnerships and collaborations to highlight the best of the Netherlands to Chinese consumers. The agreements were signed in a ceremony held during the visit to China by a delegation of Dutch companies and government officials as part of the official state visit of His Majesty Willem-Alexander, King of the Netherlands. In partnership with the Dutch Consulate, Tmall Global unveiled the Holland country pavilion and new flagship stores of supermarket chains Albert Heijn and Attent, at the "Holland E-Day @ Alibaba" event held in Alibaba's headquarters in Hangzhou, China today. In addition, Alitrip announced agreements with KLM and the Netherlands Board of Tourism & Conventions (NBTC), in a series of initiatives that form part of Alibaba's European expansion and broader globalization strategy. At the "Holland E-Day @ Alibaba" event, Jack Ma, Chairman of Alibaba Group, and other executives welcomed His Majesty Willem-Alexander, King of the Netherlands, and a delegation of Dutch companies and government representatives, including Minister Sharon Dijksma, Minister for Agriculture; Pieter Elbers, President and CEO of KLM; Andrew van der Feltz, Global Director of Business Development & Operations at NBTC; Hanneke Faber, CEO of Ahold Online; and Sjaak Kranendonk, Managing Director of Spar Holding B.V.
During the event, Tmall Global shared details of the Holland country pavilion, which will showcase popular Dutch brands such as Nutrilon, Hero Baby, Philips and Friso. Tmall Global also held signing ceremonies with the parent companies of Albert Heijn and Attent to strengthen their strategic partnerships on the platform respectively. By welcoming more major Dutch merchants onto the platform, Chinese consumers will have access to a wider range of high quality, authentic European products. As part of the agreement between Alitrip and NBTC, the two parties will work together to explore new ways of collaboration and establish a destination page (holland.alitrip.com) for Chinese travelers; while KLM will launch its airline flagship store on Alitrip.com to provide Chinese travelers flight tickets and services. "Holland is a nation that can make impossible possible, and it's a quality that we as a company shares" says Jack Ma. "Many people said 16 years ago our dream was impossible, but we have made it a reality today. Now we have over 120 million people shopping on our marketplaces each day, where they have access to products and fresh produces from far away countries around the world such as Holland. By working together, we have made all these things possible today." Over 80 Dutch brands currently offer products and services on Tmall and Tmall Global. Many Dutch brands are also participating in Tmall's 11.11 Global Shopping Festival promotions, including Hero Baby, Friso, Philips, Nutrilon, and Attent. Under the theme of globalization, this year's 11.11 Global Shopping Festival will bring in around 6 million products from more than 40,000 merchants and 30,000 brands, including 5,000 overseas brands from 25 countries and regions such as the U.S., Europe, Japan and South Korea.